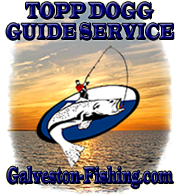 Topp Dogg Fishing Guides provides various types of private guided Galveston Fishing Guides for the entire Galveston Bay Complex. 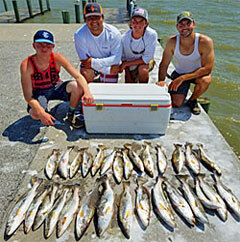 Most of these trips are bay outings for 1-4 anglers that target speckled trout and red fish. Seasonal trips and kid/family adventures are available at certain times of the year. Topp Dogg Fishing Guides can also handle multiple boats for corporate or tournament type events. It has been family owned by Capt. Alan Pereyra and Capt. Steven Pereyra since the year 2000. Both of these Captains have been very successful in this industry because of their excellent customers service and dedication to giving all their guest an exciting and memorable fishing experience. 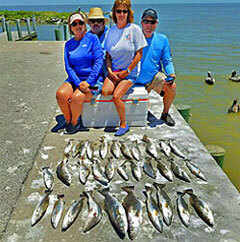 If you are looking to hire a Galveston Fishing Guide that has all the experience and fishing knowledge for the entire Galveston Bay waters that will maximize your fishing experience, then you need to give either Capt. Alan (832) 606-0844 or Capt. Steven (832) 659-1554 a call and reserve your trip today. 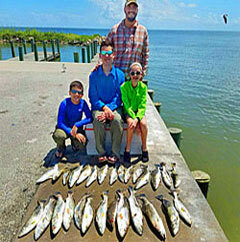 • A variety of fishing trips & charters from 1-4 anglers per boat and 1-25 boats for corporate events. Galveston, Texas City, San Leon, Dickinson, Santa Fe, Seabrook, League City, La Porte, Kemah, Clear Lake and Baytown. Zip Codes served: 77554, 77553, 77552, 77551, 77550, 77590, 77539, 77565, 77058, 77598, 77571 and 77520. Topp Dogg Fishing Guides accepts all major credit cards, debit cards, bank cards, cash, local checks and payment through PayPal. You can use PayPal for your initial trip deposit, the full payment or remaing payment. This website is a secure website with a SSL Certificate.